Pale strands of my hair tangled into the mess of dusky flowers in my lap. Mike’s car sliced quietly through the lukewarm air of the countryside until a gravel drive slid into view. We turned into it with a crunch, parked, and began the arduous process of shuttling picnic supplies down a rocky path. Some time later we sat alone by a still pond, the flowers now perched on a stack of books beside us. We’d just finished eating an elaborate lunch on my childhood patchwork quilt. The ground was hard and uneven — it always seemed so soft in movies — but at one point I lay down, the silk of my slip dress cool in the autumn breeze, and watched the highest leaves fluttering against the sky. Then I looked back to Mike’s ruddy, bespectacled face and smiled. Sometimes you only realize how special a moment is once it’s passed, but every now and then, you get the gift of realizing in the moment itself. This was one of those times. I’d never been on a legitimate blanket-on-the-ground picnic before, and living in different cities, Mike and I rarely got to just sit and enjoy each other’s company. Now here we were, grinning at each other, stuffed like turkeys in the middle of the woods and post-lunch euphoria. The streamer of hearts I’d hung from the trees around us whispered in the wind. The whole afternoon spread out before us. That was last fall. In the dark days that followed, I remembered that picnic as a bright bit of joy to hold onto. Sitting by a fire in Gatlinburg with Mike, drinking hot chocolate in mugs we’d just bought from a Walgreens around the corner. Dancing with a stranger on the sidewalk one night in San Francisco. Pausing with Mike on the stairwell of my apartment building to watch the sunset. Looking down at the fluffy mop in my lap while driving home from Carolina Poodle Rescue and realizing that Byrd was truly mine. Embracing my new friend, 7-year-old Zoe, when she ran up to hug me after we’d been baptized together one Sunday morning. Walking alone across the Georgia Tech campus one summer night in the middle of my teacher training, the golden skyline glowing above me. Getting the phone call where my dad revealed that after years of dangerous treatments, he was cancer-free. Running barefoot through the grass in La Jolla one warm night with my sister, Sarah, for no reason at all. Sitting in traffic on i-85 to Raleigh with the sun illuminating the gorgeous fall leaves and little Byrd poking her nose out the open window. 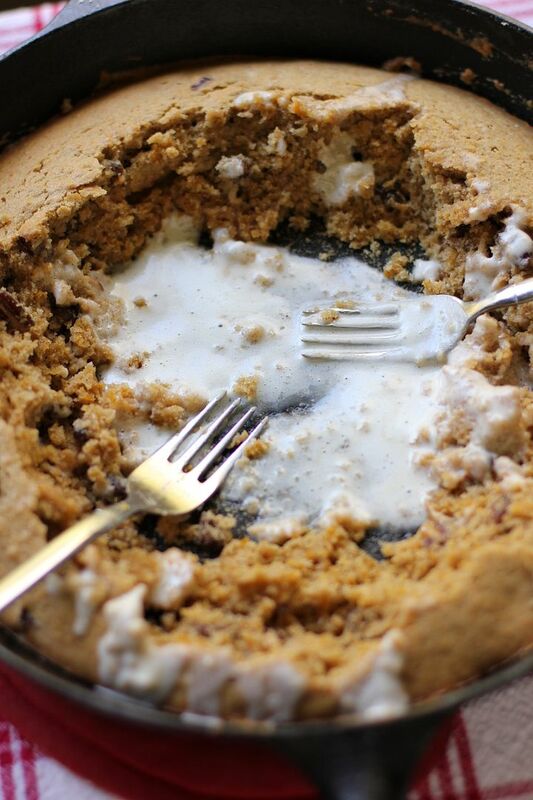 And, most recently, sitting with Mike and eating gooey pumpkin cookie cake straight out of my cast iron skillet. I’d just pulled the cake from the oven and taken dozens of photos, and with my camera still propped up beside me, we dug in. No plates needed — just forks and some ice cream. There’s just nothing like the casual, sweet act of devouring forkfuls of a shared dessert without even an ounce of fuss. And this cake! I made it twice to fiddle with proportions a bit. The first version (pictured throughout this post) was great, but the second version (see pictures below) was insane: a moist, gooey, comforting cake boasting surprise bites of caramel and toasted pecans. 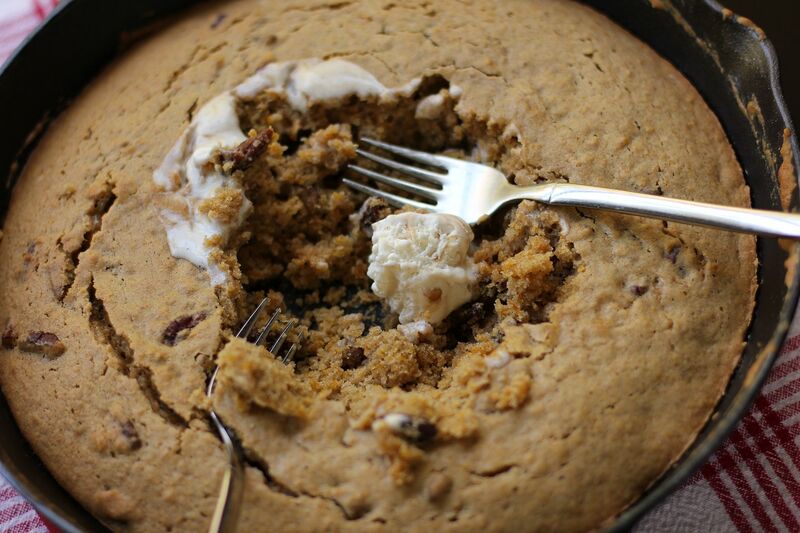 Not only that, but you can make this cake in about half an hour with one skillet! Even if you choose to toast up some pecans and make some streusel to go with it (which I recommend! ), you’ll have minimal dishes to wash. Especially if you skip the plates. A slice of the final cake. You have to make this thing as soon as possible. Make it tonight! 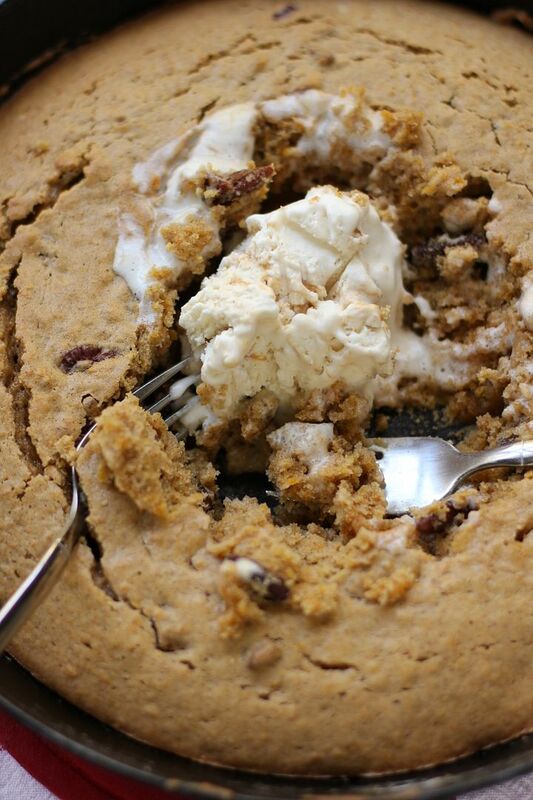 Throw it together and eat it on the couch with someone sweet. Or take it to your Halloween parties. Or eat the entire thing alone while watching old episodes of Hoarders. No judgments. It’ll be amazing no matter what. And in the meantime, share a beautiful moment that stands out in your memory. 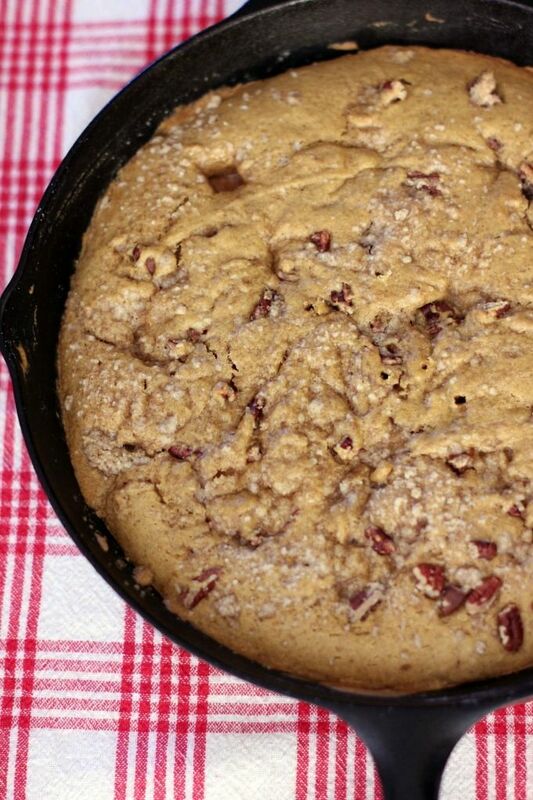 Note: The first time I made this cookie cake, I mixed in 1/2 cup of chopped pecans that I’d toasted (on a sheet pan at 350 degrees F for about 6 minutes or until fragrant, stirring a couple of times). The second time I made it, I mixed in this toasted pecan streusel — heavenly! These extra mix-ins will add a bowl and a sheet pan to your prep, but I highly recommend them. 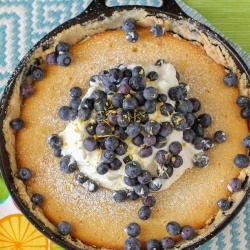 Preheat the oven to 350 degrees F. In a 10- or 12-inch cast iron skillet over medium heat, melt the butter. Stir in the vegetable oil, sugars, and vanilla and remove from heat. Let this mixture cool until the pan is no longer hot (about 5 minutes) so you won’t scramble your eggs. Add both eggs to the butter mixture, whisking them well to combine. Whisk in the pumpkin. In a separate bowl, whisk together the flour, salt, baking soda, baking powder, cinnamon, nutmeg, ginger, allspice (Note: it’s kind of lame to use another bowl for this, and according to Sophistimom, you should be able to just dump all your dry ingredients on top and whisk them in well, but I was too chicken to try. 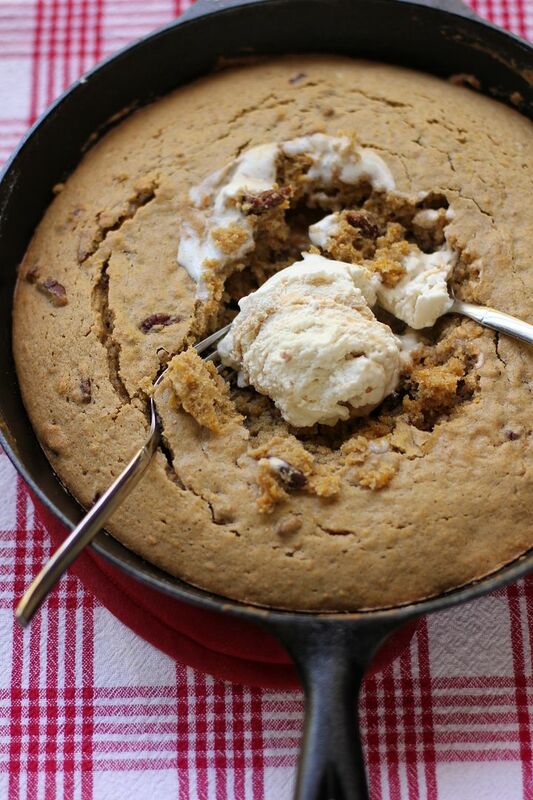 So I guess this is technically “One-Skillet, One-Bowl” cake if you do it my way. If you just dump them in, please let me know how it goes!) Whisk the dry ingredients into the wet and pour the batter into your skillet. Stir in the toasted pecans or streusel if you’re using them. Place dollops of dulce de leche or caramel candies around the surface of the batter. Bake your skillet cookie for 15-25* minutes, or until the edges are getting golden and the center is still soft (a toothpick inserted into the center should come out with some moist crumbs, but no liquid batter). Eat immediately (preferably straight out of the skillet!) with heaps of vanilla ice cream (or a fun caramel flavor). *Depending on your skillet, this cooking time can really vary. I’d start checking at 15 minutes and then check every couple of minutes after that with toothpicks. Make sure to look for moist crumbs, not a clean toothpick. If you overbake, it might be dry! Recipe before and after tweaking to warm, gooey perfection. Need a closer look at the final product? Gooey, caramelly, streuselly, pumpkiny, amazing. Is this super sweet? Or could you do it with a cream cheese frosting? It’s not SUPER sweet on its own (so the ice cream wasn’t overkill, for instance). If you did it with cream cheese frosting, just make sure to let it cool first (and I’d nix the ice cream altogether in that case). And a warning: it’s so moist that it’s not a pretty cake upon being removed from the pan. 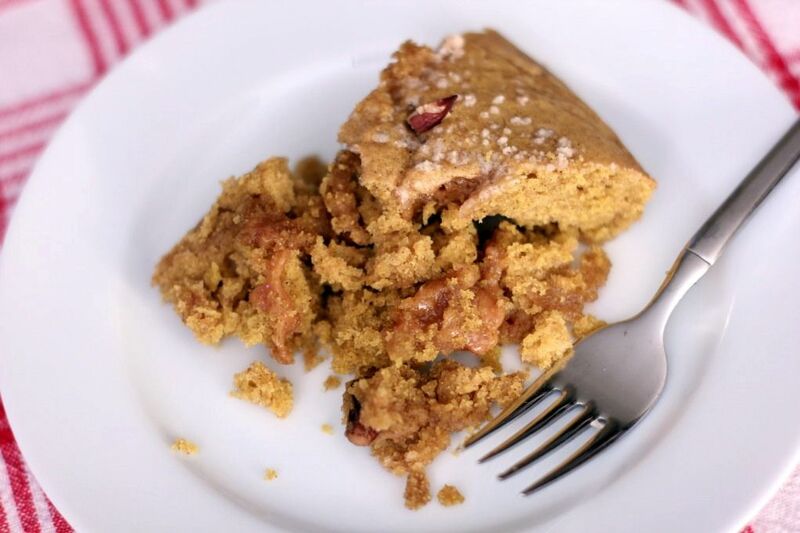 It’s more of the warm, fall-apart cake variety (as shown above). If you want to remove it as cleanly as possible, let it cool completely (several hours) and then chill for a bit before removing. Sounds like I need to take a trip down to South Pittsburg, TN and buy some mini skillets so we can serve these straight out of skillets. We have a wonderful park for picnics but most folks like to sit on the front porch or up on the deck to watch the fall leaves flutter by and laugh at the squirrels zipping around the hundred year Oaks. As the weather gets colder this would be great to serve at table inside with a hot cup’a or a fresh brewed coffee. Yes, I think we need to try this and share a sample with our customers… I think I’ll go do that. Thank you for sharing! Sounds delicious. I love your memories! Hi Nora, Unfortunately I don’t have a print link for recipes yet, but I always just copy and paste the recipe into a text or word document to print. Hope that helps — and hope to get a print link soon 🙂 Thanks! Sadly, I lost my cast iron skillets in the divorce. I’m going to have to try this in a regular glass cake pan. And yes, I *am* going to make it today. Aw, I’m so sad to hear that about your cast iron! PLEASE do come back and let us know how it goes in the glass dish — I was wondering how it would work in other pans and I’m sure that knowledge would help some other cast ironless soul quite a bit! My cast iron skillet is mostly used for cornbread…and is only eight inches. Do you think this recipe would fit, or would it overflow? I was thinking..if it would fit, I would have to increase the baking time…right? Thanks for any advice you can give me, I really want to make this gooey delight. Hi Michele! I’d cut this recipe in half and I bet it’ll be just right! The baking time will probably be shorter — I would check with a toothpick at 10 minutes and every couple of minutes after that. I’m guessing it’ll take about 15, but check early and often 🙂 Can’t wait to hear what you think! Eating it straight from the skillet adds to rhe fun of it. It really does! Thanks, Sandra! What great memories! This cakes looks abosolutely delightful! I didn’t know you just got baptized! I was baptized 5 years ago, and I was just telling someone the other day how cool it is to be able to REMEMBER your own baptism. Most people get baptized as babies, but not us. We chose it and get to remember it. It’s truly amazing. Aw, Christina, this comment means so much to me. Thank you!! I love that you were baptized recently too. I was first baptized when I was 10, but my church lost the records — and I was actually glad to be able to do it again in front of my current church family. And to meet little Zoe, which was truly a blessing. It really is wonderful to have had that experience recently <3 I'm glad you had it, too! O m g. This is right up my alley. You have so many talents. Your writing is beautiful, not to mention your treats. Beautiful memories are such great things…it’s amazing how those little moments find a way to stick. 🙂 I think my most recent one is walking down the street and admiring a tree that is the most vibrant pumpkin orange color right now! Aw, I love it! Those trees are my favorite right now! This recipe may be the one to make me overcome my fear, light the pilot in the oven, and make pumpkin cake in a skillet, and eat it right from the skillet. Although I wish I had a lovely place to display it the way you do, and perhaps a few people around to share it with when I make it! Your blog has some of the MOST AMAZING food pics I have ever seen. It makes me want to lick the computer screen (I somehow manage to stop that urge, but it’s nonetheless there). 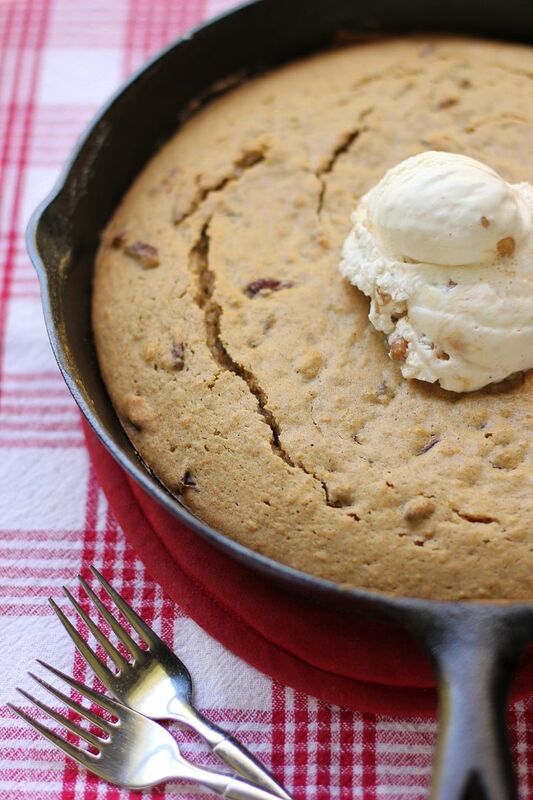 I am making the pumpkin pull apart bread tonight to have tomorrow at breakfast, but I may also have to make this pumpkin skillet thing. You know…for lunch. Cannot wait to try it. Julie, your post has my eyes all full at work. I just adore you, really. The cake is gorgeous, but not nearly as beautiful as you. I fully treasure you. Aw, Sabrina, you are the sweetest! Your comment has MY eyes all full at work. Thank you, love! It means a lot. I don’t know how I missed this post back in October but it made for perfect reading tonight, New Year’s Eve. I smiled all the way through…..sharing your memories. Happy New Year, Julie. I’m looking forward to another year of wonderful recipes and blogs. 1. What size can of pumpkin? I assume the smaller one, but want to make sure. 2. I made the dulce de leche: How much sugar did you end up using when you added in the caramel sauce? 3. Also planning on using the streusel – Should I use the entire amount that the streusel recipe calls for? This is for “date night” and serving in pan, 2 spoons in front of fire! Thank you for so many delightful, crazy delish recipes! 1. It’s not a can of pumpkin; just 1 cup. 2. I used the same amount listed, but I used more solid caramels. I don’t think it’ll be too much, but if you’re worried, you could cut the white sugar down to 1/2 cup. Oops, I see I CUP pumpkin, not 1 CAN. Doh!! So I baked this early this morning and have a question….why do I have globs of Dulce de Leche all around the top? They didn’t melt into the batter at all. I put blobs around the same size as a caramel would have been? I actually made the whole streusel receipe and put it in the cake, just seeing the note that someone wrote you and your answer. Hoping it still tastes good. Donna, the caramels don’t melt — they just provide a fun bite similar to what a chocolate chip or nut would in a cookie. I can’t imagine it not tasting good 🙂 Hope you enjoy! 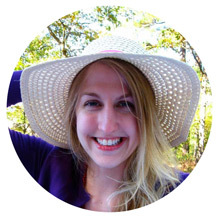 I am so glad I stumbled onto your blog and even happier to read of your baptism. That makes us sisters in spirit. 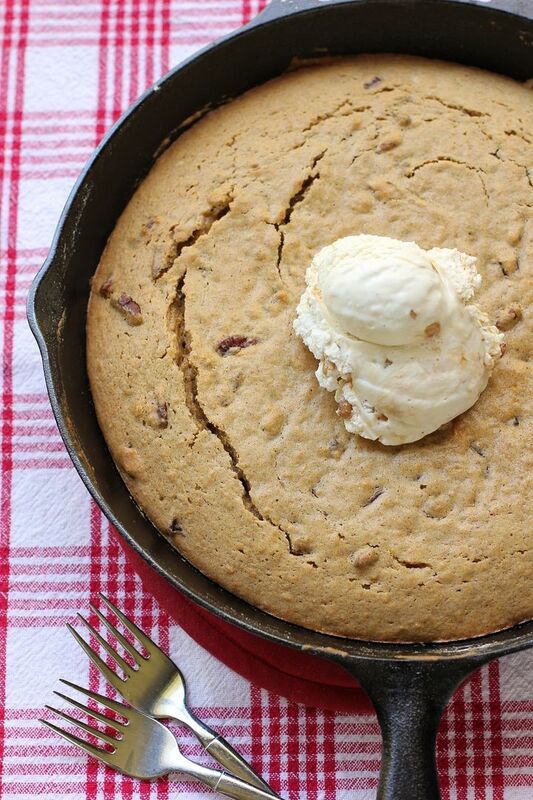 Your chocolate and pumpkin skillet cakes have been a hit here in our home. I loved your memories you shared. So picturesque.